Mi4biz identifies the problem; determines the workflow; assigns tasks to the units and the departments; follows up on the processes and escalates delays to the senior management. “In recent years, we have been after creating resolution mechanisms with a vow-factor.” says Mr. Salih Karabulut. It is almost impossible not to get lost amidst this huge data transfer on this on- line sales platform where a property is rented or sold every 40 seconds. On the one side are sellers who want easy access to customers and on the other side are buyers who want to be properly informed about the services and products they wish to purchase without a niggling thought at the back of their minds as to the security of the transaction. As we all know, the most critical aspect of e-commerce is security. It is the golden rule in the world of e-commerce to have business solutions that make both buyers and sellers feel secure in their transactions. Doing that, you always need to be aware of the fact that accessibility will always be your greatest asset. Sahibinden.com has already gone beyond the point of being a mere e-platform accessed by users on-line. Customers can easily reach someone when they need help via a phone call, mobile platforms, e-mail or the social media and they get fast responses to their queries, helping establish between the corporation and customers a strong bond of confidence and trust. 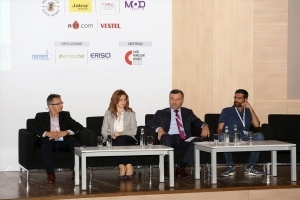 Mr. Salih Karabulut, Service and Customer Experience Manager at Sahibinden.com, who joined the ”Sustainable Customer Satisfaction” panel at the 2nd Call Center Summit held on 31 May, shared with us tips on customer behavior in this parallel universe. Panel sırasında sorduğum sorulara aldığım cevaplar öncelikle yaptığı işe dair felsefesi olan bir rakam profesyoneli ile karşılaştırdığı için şaşırttı. Mr. Salih’s words had both a philosophical essence and a purely rational basis in mathematical terms. If you are living on so much data, what would be those specific service features your customers expect from you? I understand it perfectly well those customers seek ‘instant‘ solutions but are not the word ‘clear‘ a bit confusing? ‘Openness’ stands for ‘transparency’. Sahibinden.com informs its customers of each stage of the handling of their demands or complaints. Depending on their preferences, each customer is automatically notified of any changes in the status of their complaint either via sms or e-mail. Thus, the customers are able to track which unit or department has been handling their claim for how long, enabling them to get actively involved in the resolution process. But then again, what does ‘socialization in lieu of institutionalization’ mean? Social media is the most powerful communication platform of our time. It allows you to create messages that may cause political or social movements. This new media may either cause you to achieve enormous growth or get totally destroyed. Therefore, all serious corporations make a point of keeping their fingers on the pulse of events unfolding around them which may have a potential impact on their business. We once again extend our sincerest gratitude to Mr. Salih Karabulut who joined the forum on behalf of Sahibinden.com and inspired the audience with his insightful comments and opinions. Thanks to him, we gained valuable insights into the processes by which Sahibinden.com keeps its keeps its ears to the ground monitoring social media sites with the help of Mi4biz. We have learnt a valuable lesson that the new world is neither Far East nor the remote continent Oceania… the actual new world is the digital world with its own unique set of rules. For companies to survive, they must pay serious attention to the crumbs of data coming from their current and potential customers and handle it systematically.